A resort town on the coast of Aberdeenshire, situated 15 miles (24 km) south of Aberdeen in a sheltered position where the Carron Water and the Cowie Water empty into the North Sea. 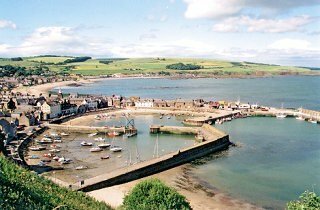 Formerly the county town of Kincardineshire, Stonehaven lies adjacent to a deeply indented bay surrounded on three sides by higher land between Downie Point and Garron Point. The harbour, consisting of two basins, was improved in the 1820s by the engineer Robert Stevenson and became an important centre of the 19th Century herring trade. During the 20th century the town changed from being a predominantly fishing settlement to a holiday resort with a variety of recreational and sporting facilities including a leisure centre, swimming pool and 18-hole golf course. Stonehaven is bypassed by the A92 and there is light industry, including furniture making, building, printing and packaging, some of which is located on the Spurryhillock Industrial Estate. Each new year is seen in with the swinging of fireballs in a celebration that is said to have originated in the 19th century as a fishermen's festival.